I love Chinese food, and I am not always able to head out to a Chinese Restaurant. Either the cost is a little high for our families appetite, or we just don't feel like taking all the kids with us. I was happy to review some food from Wanchai Ferry, because they have such a great selection of food options, they are affordable, and I can enjoy these in the comfort of my own home. Each package serves two, so our family needs about 3-4 bags, but it is such an easy preparation for our family to enjoy great tasting, restaurant quality, Chinese food. 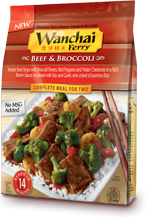 We were sent the newest Wanchai Ferry flavor Beef & Broccoli package to review. I was amazed that everything for the meal was included in the packaging. There were an assortment of Asian-style vegetables, including broccoli florets, red peppers and water chestnuts. It even includes rice and a rich brown sauce accented with soy and garlic for an authentic flavor experience. The beef and vegetables I sauteed in the pan, and while I was doing that, I steamed my rice in the microwave (in the included packaging). I was pleasantly surprised at how the rice was fluffy, great tasting, and was moist. The vegetables tasted really good, and they were perfect cuts. The beef pieces were great tasting, as well. The meal was a little spicy, and very filling, and I was eating my meal that was ready to serve in only 14 minutes. I recommend the Beef & Broccoli selection! I am excited to try the Shrimp Lo Mein and the Sweet & Sour Chicken. The other selections are: Orange Chicken, Spicy Garlic Chicken, Sweet & Spicy Shrimp, Kung Pao Chicken and Scechuan Style Chicken. Additionally, all of the entrées have no added MSG! Madame Chong, from China, left her home to make dumplings in Hong Kong. The Wanchai district is one of the busiest commercial areas in Hong Kong, and so Madame Chong went there to start a new life, and to support her two daughters. In Wachai, people/shoppers/commuters would try to get to the pier, so they would take the Wanchai Ferry across. Madame Chong started making her family recipe dumplings and sold them in a cart in Wanchai. With the attraction from many fans, and the word spreading about her great dumplings, she established the Wanchai Ferry Peking Dumpling Company in 1985. Since then, Wanchai Ferry as become the leading brand in Hong Kong and world wide. On the Wanchai website, you can download a coupon for $1.50 off your next purchase. The website also offers meal tips, which you can see other menu items that would pair well with your selection of Wanchai meal. I think they have great ideas! You can also get a $1.60 off coupon available HERE. This contest is open to bloggers and non-bloggers of the United States. Contest is open until August 19th, 2010. To enter, go check out the Wanchai Ferry selections, and comment here about which one looks delicious to you. I was sent a Wanchai Ferry prize pack and information in the mail from participating in a review campaign with Wanchai Ferry & MyBlogSpark. I am also sponsored to to host a giveaway prize pack for my readers to enter to win, provided from MyBlogSpark and Wanchai Ferry. I was sent this meal in exchange for an honest review. I am not compensated for my time or written review. The opinions in this post are of my own and do not reflect on the company. I'd love to try the Shrimp Lo Mein and the Sweet & Sour Chicken. Thanks for the review and giveaway! Based on your review, I'd love to try the Beef & Broccoli! I would like to try the Spicy Garlic Chicken! I'd love for Wanchai Ferry to have Shrimp or Chicken Chow Mein. Sometimes I crave it and don't feel like ordering out. I'd also like to tory the Spicy Garlic Chicken. I think my husband would really enjoy that one. The Sweet & Spicy Shrimp sounds good. I think it would be my daughter's favorite. The Sweet & Sour Chicken sounds like it would be delicious. I know my husband would love the Beef & Broccoli. Would love to try the Orange Chicken. The shrimp Lo Mein and Beef & Broccoli look beyond heavenly right now. I think we'll have to try that for dinner tonight! the sweet and sour chicken looks good to me! They all look great. My first choice would be The Shrimp Lo Mein! The Spicy Garlic Chicken sounds delicious. I think we'd like the Spicy Garlic Chicken the best. Shrimp Lo Main and a bottle of cold beer. I would love to try the sweet and sour chicken! Shrimp Lo Mein looks delicious! Kung Pao chicken sounds great! The Kung Pao sounds yummy! I would love to try the Sweet and Sour Chicken. Spicy Garlic Chicken. Thanks for the giveaway. Shrimp Lo Mein Sounds yummy. Orange Chicken for the win. sweet and sour chicken looks good. Thanks so much for the giveaway! 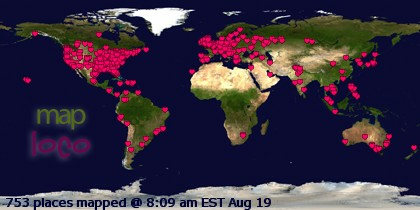 Your button is on the right side of my blog. I'd love to have any of the flavors in the freezer for those nights when I don't have a lot of time to cook. I'd still feel like I was a serving my family a nice meal! Orange Chicken looks good to me! I would love to try the Spicy Garlic Chicken. I think the Sweet & Sour Chicken looks good. Count another vote for Spicy Garlic Chicken! I don't know what it is, but I seriously can't get enough garlic these days. Thanks! Um all of them? haha - I think I'd pick the Sweet & Sour Chicken though. Looks yummy! I would love to try the Orange Chicken. Thank you for the lovely giveaway. We really like the Orange Chicken and want to try the Spicy Garlic Chicken. I'd love to try the Orange Chicken! The Spicy Garlic Chicken would be my choice! I'd love to try the Sweet and Sour chicken, yum! Orange Chicken would be yummy. They all sound good, but I would really like to try the Orange Chicken. I think my family would like to try the shrimp lo mein. Thanks! I usually go for the Orange Chicken, but I'm going to add the Sweet and Spicy Shrimp to that today! I want some Wanchai Spicy Garlic Chicken. Thanks for the contest. I've tried the beef and broccoli before. Wanchai ferry in delicious! I actually just bought and tried the Orange Chicken last week. I liked it. Now I want to try the Broccoli Beef. I would like to try the Sweet & Spicy Shrimp. IO've had the Orange chicken, and it is very good. Last night I was craving Chinese food. Would love to have had one of these in the freezer. I'm going to look for them the next time I am food shopping. Sweet & Sour Chicken sounds good! I would like to try the spicy garlic chicken. I would love to try the Orange Chicken, thanks! I would like the Orange Chicken. I'm a subscriber to your feed.